Mildronat - preparation, improves metabolism and energy supply of tissues. 60 capsules ,500 mg meldoniun in each capsules. Auxiliary ingredients: potato starch - 13.6 / 27.2 mg; Colloidal silicon dioxide - 5.4 / 10.8 mg; calcium stearate - 2.7 / 5.4 mg. The composition of the capsule shell: E171 (titanium dioxide) - 2%; Gelatin - 100%. Acute and chronic cerebral circulatory disorders, including stroke and cerebrovascular insufficiency (in the complex treatment). Retinopathy of different etiology (hypertensive, diabetic). Prescribe drugs to children under 18 years of age and lactating and pregnant women is not recommended due to a lack of clinical evidence supporting the safety and efficacy of Mildronate these groups of patients. Mildronat should be used with caution in patients with kidney and / or liver disease (especially long-term). 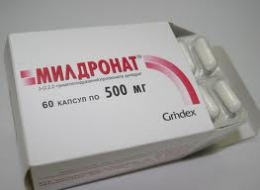 Due to the possible development of stimulating effect Mildronat recommended in the first half of the day, while taking a few times a day - no later than 17.00. Abstinence syndrome in chronic alcoholism: daily dose - 2000 mg; multiplicity of reception - 4 times a day. The duration of the therapeutic course - 7-10 days (at the same time to the specific treatment of alcoholism). 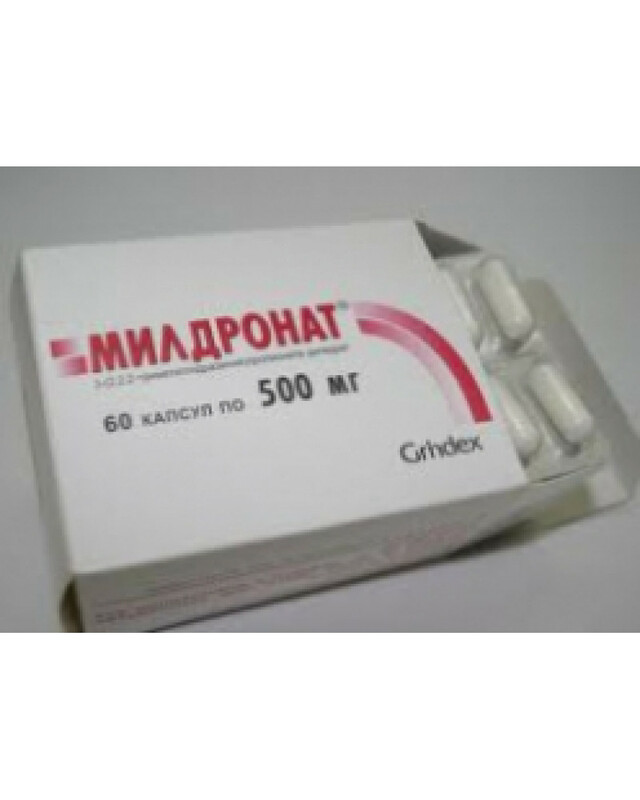 Competitors are advised to take before workouts Mildronat a single dose of 500-1000 mg 2 times a day. The duration of the preparatory period - 2-3 weeks, during the period of competition - 10-14 days. Mildronat in the form of a solution for injection is administered intravenously and parabulbarno. Alcoholism: daily dose - 1000 mg; multiplicity of application - 2 times a day. The duration of the treatment course - 10-14 days. In vascular pathologies and degenerative diseases of the retina Mildronat parabulbarno should be administered at a dose of 0.5 ml solution for injection at a concentration of 500 mg / 5 ml for 10 days. In rare cases, when applying Mildronate in all dosage forms may develop side effects such as: allergic reaction (itching, redness of the skin, hives, skin rash, angioedema), dyspepsia, tachycardia, increased or decreased blood pressure, increased excitability. In very rare cases may develop eosinophilia and total weakness.